Poyner and his volunteer team arrived from the U.S. by a humanitarian flight to help. A self-described “tech guy,” Poyner lives in Oklahoma and found himself here after learning how severely disconnected this isolated area was from the rest of the island – and the world. 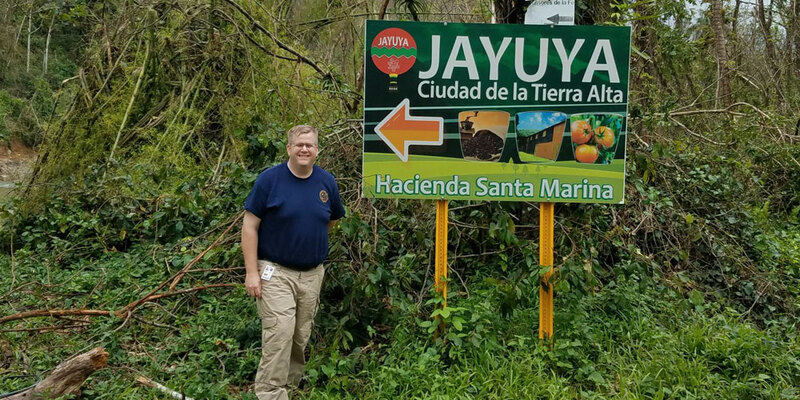 Jeff Poyner’s volunteer work in Jayuya included mobilizing a local school’s kitchen and securing a satellite phone for the community’s use. His goal: to re-establish emergency communications by providing satellite broadband in the hardest hit parts of Puerto Rico. As it turns out, Poyner and his co-volunteers did much more. When Poyner and team arrived, it had been a week since supplies were last delivered to this area – and the roads were still impassable. Right away, they noticed some things: Bamboo was being used to direct spring water from a local river for drinking and washing. The villages had gardens, but the winds had stripped the plants bare. While the local store had some food, the doors were locked. The banks and ATMs couldn’t distribute cash, so people had no way to pay for things. So, Poyner helped organize the purchase of food, infant formula and bottled water – funded by Dell – and had it delivered by a Federal Emergency Management Agency (FEMA) helicopter. He then worked with the U.S. Department of Homeland Security to make sure those supplies were distributed fairly. “I’ve learned from leaders in my work, when you’re analyzing a business situation, you have to focus on people first. In a disaster, that’s even more important. You need to be thoughtful about connecting people with the things they need the most, like food and water – before you look at everything else,” Poyner says. Poyner’s trip was part of a volunteer effort organized by the Information Technology Disaster Resource Center (ITDRC), a non-profit started in 2008 in Fort Worth, Texas, with the mission to provide communities with the technical resources necessary to continue operations and begin recovery after a disaster. Much of ITDRC’s efforts after disasters are made possible due to the partnerships and cooperation with numerous partners such as Dell, Dish network, Google, and more. Poyner and ITDRC first volunteered together after Hurricane Harvey, setting-up internet access stations in over eight shelters. These are tech professionals with the skills to tackle big obstacles. Poyner arranged for the shipment of over 50 Dell Chromebooks for use by Puerto Rico residents at over 23 sites where he and ITDRC made internet-based communications possible. This Dell equipment is still being used today so citizens can contact FEMA and loved ones. ITDRC Operations Director Joe Hillis says, “Disasters typically interrupt telephone and Internet communications for days, or even weeks. In this case, it’s been months – leaving survivors feeling isolated and afraid. Technical skills like Poyner’s and those of ITDRC’s 900-plus volunteers nationwide are critical to restoring communications – and the physical, emotional, and economic security of a community. Hillis says it could take years to rebuild the telecommunications infrastructure in Puerto Rico. 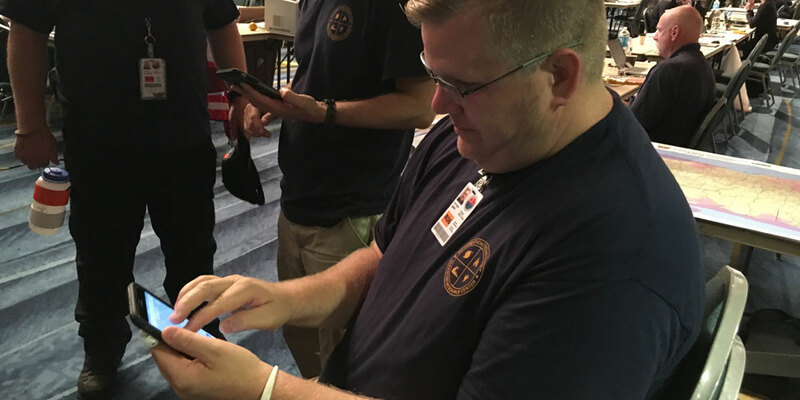 “Our mission is to provide temporary communications and technical resources for key critical resources like hospitals, public safety agencies, as well as public gathering spaces in the interim,” Hillis adds. Jeff with the ITDRC team in Puerto Rico. The team installed Wi-Fi and telephones for the Puerto Rico Secretary of State’s team inside the convention center (pictured). Since joining Dell in 2007, Poyner has volunteered hundreds of hours. He’s developed a knack for figuring out how to get the right Dell technology, volunteers and more to help after natural disasters. His previous work experience as a Dell disaster recovery specialist has come in handy, he says. Poyner’s mom, a long-time American Red Cross mental health volunteer, continues to inspire him. Many Dell employees share this sentiment – with adventures in volunteerism experienced by over 42 percent of Dell professionals around the world in 2017. Dell encourages community service for many reasons, including that it boosts team members’ happiness and helps team members gain new skills and insights they can use in service to Dell customers. Team members may volunteer for any charity of their choice, during or after work hours. In this challenging year of catastrophes, Dell team members have volunteered hundreds of hours to relief and recovery efforts and donated more than $643,000 toward disaster relief. “In this challenging year of catastrophes, Dell team members have volunteered hundreds of hours to relief and recovery efforts and donated more than $643,000 toward disaster relief,” says Dell Latin America Giving/Global Disaster Relief Response Manager Alicia Lopez. This amount includes Dell-match funding; Dell matches every dollar donated up to $10,000 USD per team member, per year. Dell is celebrating Giving Tuesday by recognizing Poyner and others for their volunteer work. Dell volunteers from many facets of Dell’s business traveled to Puerto Rico to assist FEMA, American Red Cross and ITDRC to help restore critical infrastructure. The Dell Logistics Team gathered and delivered donations – including food, batteries, and first aid kits – from global Dell employees to the Puerto Rico Community Foundation. Magda Sanchez, a strategist with Dell Customer Support Services; Ileana Isern-Flecha, a senior advisor for Dell SDS Business Intelligence and Mariely Franzetti, Dell Vice President of Support Services IT, volunteered over 100 hours collectively in numerous initiatives for Puerto Rico. These employees coordinated Dell’s purchase of two generators that Poyner then used to mobilize the local schools’ kitchens in Jayuya. “We treated this like a work project and used our skills to network and work through logistics to get supplies to our Dell employees and whomever else we could help in Puerto Rico,” Sanchez says. With the help of their colleagues, family and friends, they raised over $83,000 and donated it to the Puerto Rico Community Foundation. Today, only half of the island’s more than three million residents have had their electricity restored. Help people affected by Hurricane Maria by visiting org, calling 1-800-RED CROSS or texting the word MARIA to 90999 to make a $10 donation.